Only Genuine Subaru Remanufactured Parts are designed to fit like a new Subaru part, with all of the original specifications. Genuine Subaru Remanufactured Parts are held to the same high standards as original parts and scrutinized under the same quality testing, and are supported by the Genuine Subaru Parts Limited Warranty that backs new parts. 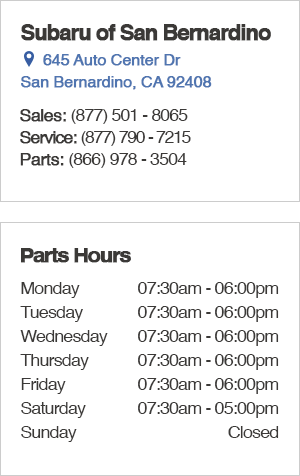 What makes Genuine Subaru Remanufactured Parts different from new Genuine Subaru OEM Parts? It comes down to price. Rather than building from scratch, Genuine Subaru Remanufactured Parts are made from an existing part, saving a great deal and the savings are passed on to you, the Subaru driver. Other rebuilders only replace the broken and incompatible components without a full inspection of all components and the whole part. Any other part only meets the standards of the rebuilder and not the rigorous requirements of Subaru. Subaru Genuine Remanufactured Parts begin with the "core" of an existing part. This core is taken apart and each individual component is either serviced or replaced- every detail is inspected. The reassembly process requires testing each step of the way to ensure the remanufactured part meets the standards that are demanded of New Genuine Subaru Parts. A Genuine Subaru Remanufactured Part maintains the integrity of your vehicle, keeping you safe and saving you money in the long haul.